Looking east from the sundeck of the Montreal Inn in Cape May a few moments before sunrise, yesterday. Sunrises, I think, touch a special place in the soul, and, of course there is noting like a sunrise over the ocean where you can see right out to the edge of the world. On a morning like this, even if just for a second there, it takes a hard heart indeed…or one deeply troubled, beaten well down…not to embrace the cliché: every new day is a miracle. It is easy for the hopeful to take such beauty at the beginning as a promise of the potential of the day. And, of course, part of the wonder comes from the fact that every sunrise is not so spectacular. Our lives don’t always allow us to see the sunrise at all, and there are days when the sun just sneaks up behind clouds (literal or figurative) with no display (or none we can see). So we have reason to celebrate the moments like this one. The moment itself is a gift from the creator, and so is the ability to appreciate it. On the technical side, this is a 9 exposure HDR panorama: 3 sets of 3 exposures blended and tone-mapped in Photomatix, the results stitched in PhotoShop Elements, and the the panorama final processed in Lightroom. Best viewed as large as your monitor will take it. 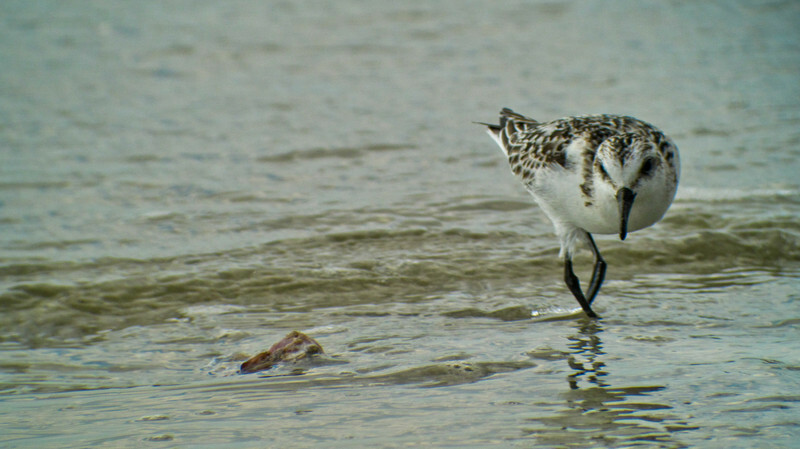 Sanderlings, plain as they are in winter plumage, are interesting birds to watch as they dance along the edge of the surf feeding…constantly feeding…constantly moving. Difficult to photograph though, and especially difficult to digiscope. 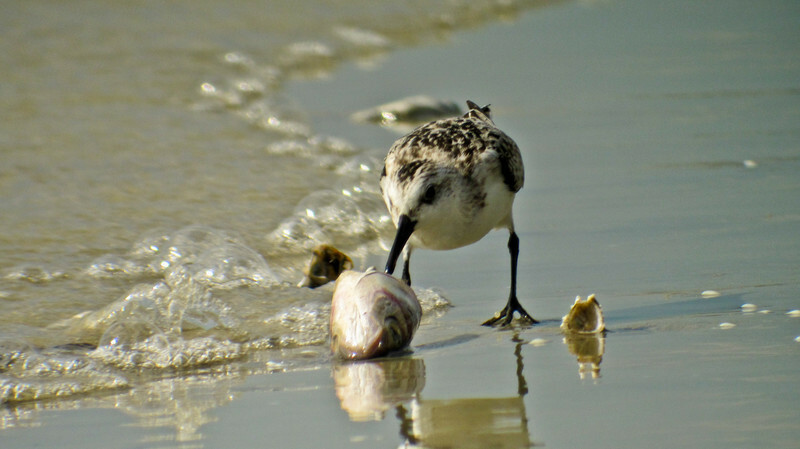 These shots are along the South Beach at Jekyll Island GA, just off the St. Andrews Picnic Grounds, where the fisherman work with their hand nets at the right tide, and the dolphins play and feed at almost any tide. 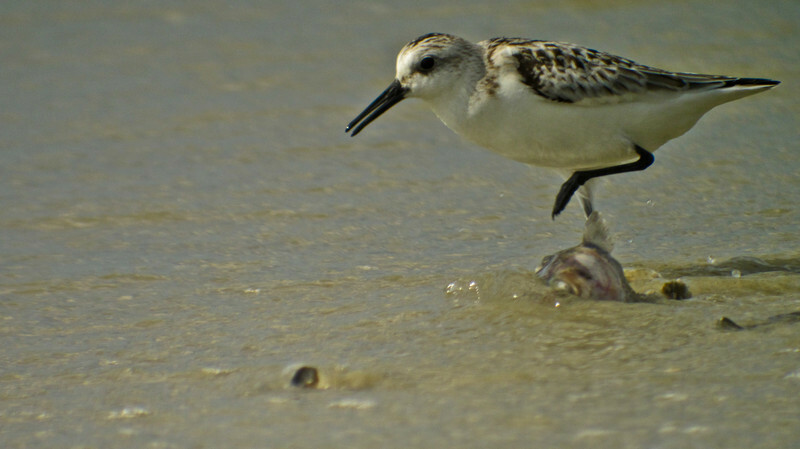 Same with Sanderlings. At least in October. Canon SD4000IS behind the new Vario eyepiece on the ZEISS DiaScope 65FL. The top two shots are at about 2000mm equivalent field of view, and the bottom shot, where the bird was closer, was at about 1000mm. All at ISO 125 and 1/1000th sec. with the f-stop around f5-f6. The rig was running right along the line where some exposures were scope limited and some were camera limited. Blackpoint right in Lighroom, added Clarity and Vibrance, and Sharpen narrow edges preset. Even at 1/1000th of a second, these guys are hard to hold still. 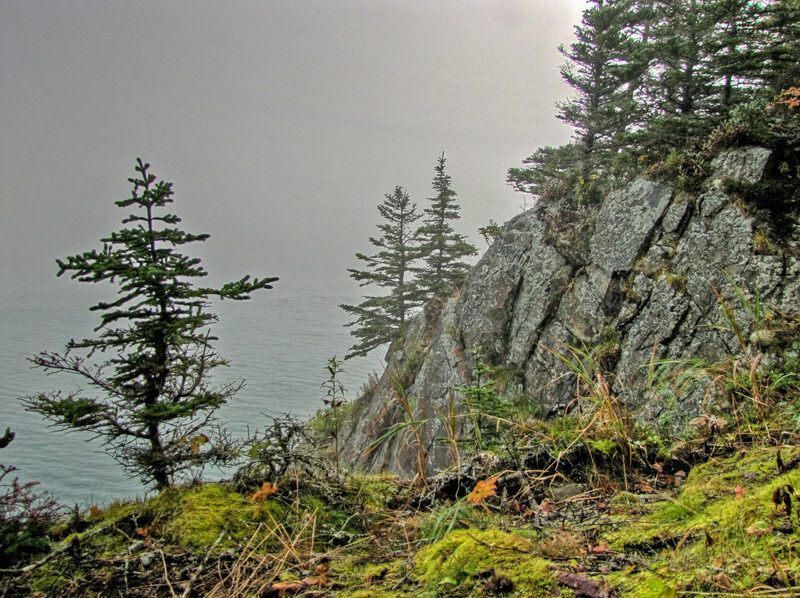 I am certain this spot has another name, but to us it is Hidden Cove. It is off the Park Loop road in Acadia National Park, and only marked by a small parking area across the road from what, if you are looking closely, is the head of a set of stairs that promises to lead down to the ocean. The stairs put you on that pebble beach. Walking the “ready made” trails out to the north of the stair head takes you to one of the points that frames the cove, and I took this shot from there. As you see it was still a foggy day and the vista is limited by the moisture in the air. At the same time, the moisture brings out all the rich tones in the rocks at my feet. Canon SX20IS at 28mm equivalent, f4.0 @ 1/160th @ ISO 80. Landscape program. Fill Light in Lightroom for the foreground and to bring up the detail in the evergreens, Blackpoint right for intensity, added Clarity and Vibrance, and Sharpen narrow edges preset. 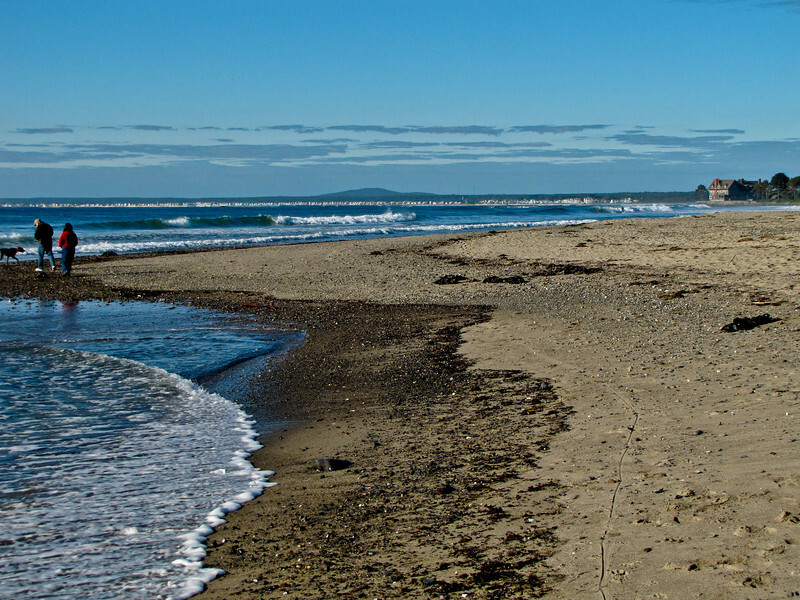 This is the view from the beach looking out to the point from where the first image was taken. 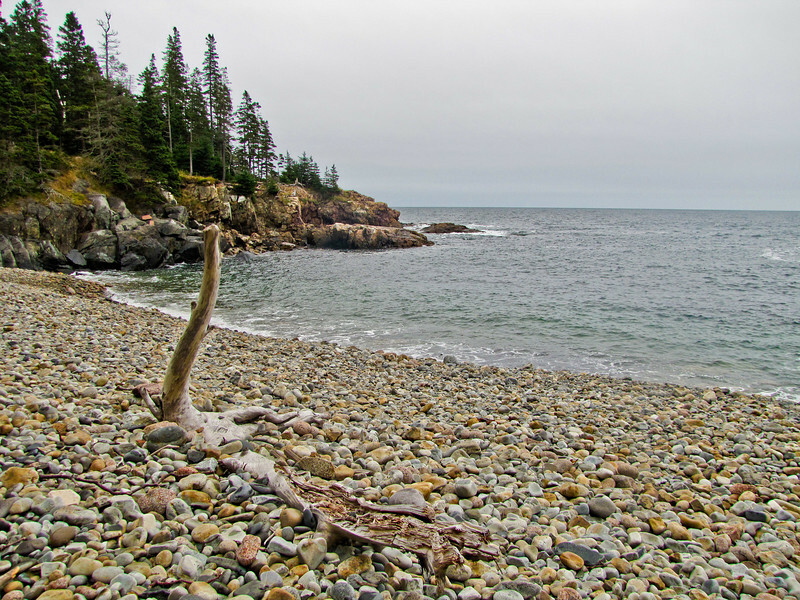 This is from my trip to Bar Harbor and Acadia National Park a few weeks ago. I have lots of photos of the Margret Todd, one of the more picturesque (by intention) boats using Bar Harbor. With its maroon sails, it does the scenic thing several times a day on Frenchman’s Bay, ending with a sunset dinner cruise every fair evening. 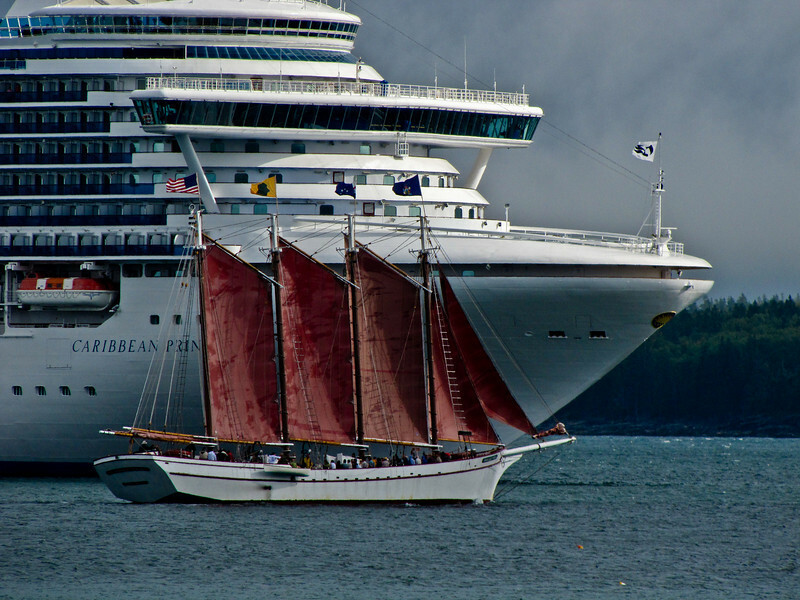 The Caribbean Princes behind the Maggy Todd, on the other hand, is also typical of the boats that use the harbor…Bar Harbor is a regular stop for the cruise ships that work the eastern seaboard of the Americas from the Caribbean to to Newfoundland. They arrive in the night, ferry passengers ashore in the morning in an endless relay of shore boats, 30 folks at a time, and the passengers spend the day spending money at the throng of gifty and arty shops that line the streets of downtown Bar Harbor, spending money (via bus excursions, or even taxi) seeing the sights of Acadia National Park, or spending money visiting one of the tourist attractions that dot the island (museums, Oceanariums, etc., there is even a Maine Lumberjack show in Trenton across the mainland bridge). What is of interest to me here, of course, is simply the size difference between the ships. Aboard the Maggy Todd you have the impression of being on a fair sized sloop indeed…but seen under the bows of an ocean going liner you get a different picture…it is not so much that the Maggy Todd is small, but that the liner is HUGE. How very tall it is! The Princess carries 3000 passengers when full and it not the biggest boat that drops anchor in Bar Harbor. That is totally amazing. A closer view adds some human scale. The Maggy Todd is actually as close as it looks here. It must have passed within 50 yards of the bow of the Caribbean Princess (and its mast tops were closer), giving the passengers of both boats a rare thrill. Canon SX20IS, my normal processing in Lighroom, with some distortion correction in the top shot to bring the water back to level, and a crop for composition. This needs to be viewed as large as your monitor will allow. Click the image and use the size controls at the top of the window that opens. 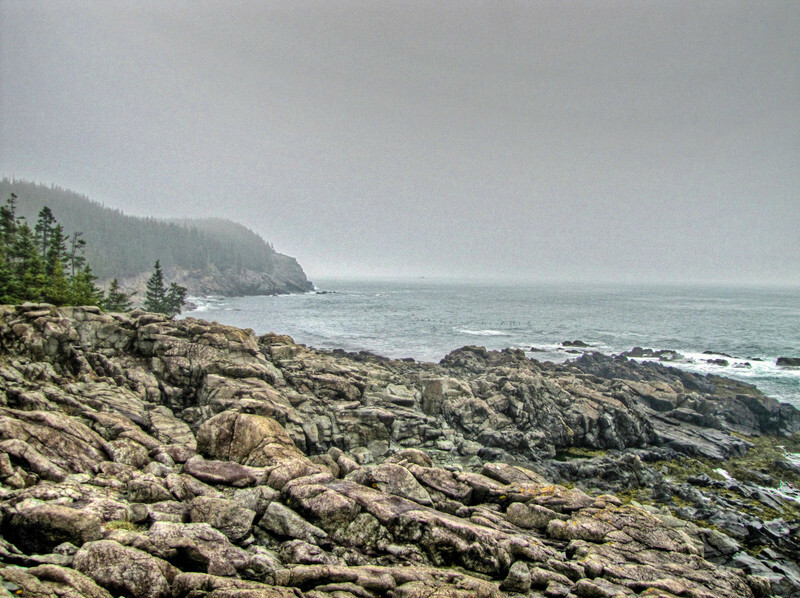 The fog never did lift during my visit to Quoddy Head State Park. I hiked as far down the coast as Green Point. This is a panorama of 4 28mm equivalent shots, looking south, assembled with PhotoShop Elements Panorama tool, and processed in Lightroom (Fill Light, Blackpoint, Clarity, Vibrance, and Sharpen). This is the standard Canon SX20IS wide angle view north from the other side of Green Point. 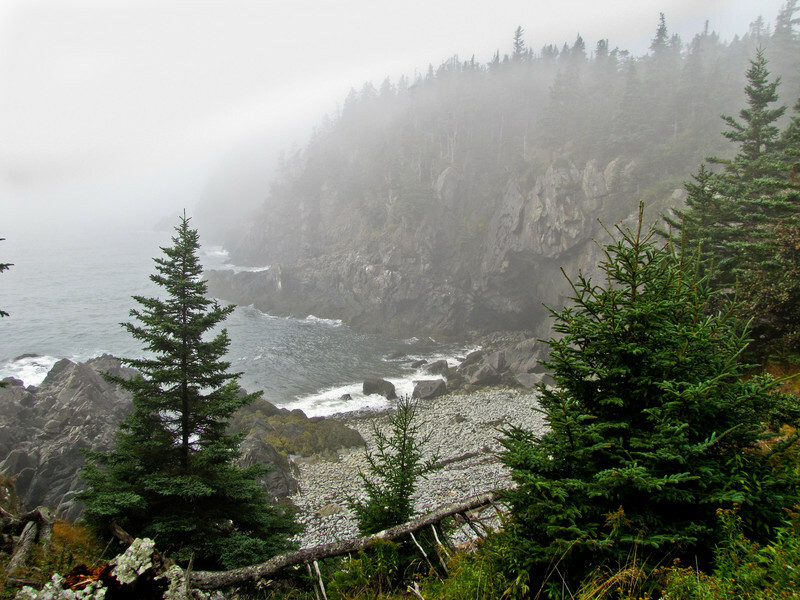 This has to be the epitome of Maine’s rock-bound, fog-bound coast! Fog is difficult to photograph, since the scattered light within the fog itself makes it photographically bright, though it has the opposite effect to the natural eye. A bank of fog almost always comes out as a white indistinct mass in an image. If you expose for the fog, to keep it natural, then the landscape under it goes dark and muddy. Seems like an ideal situation for HDR…kind of. 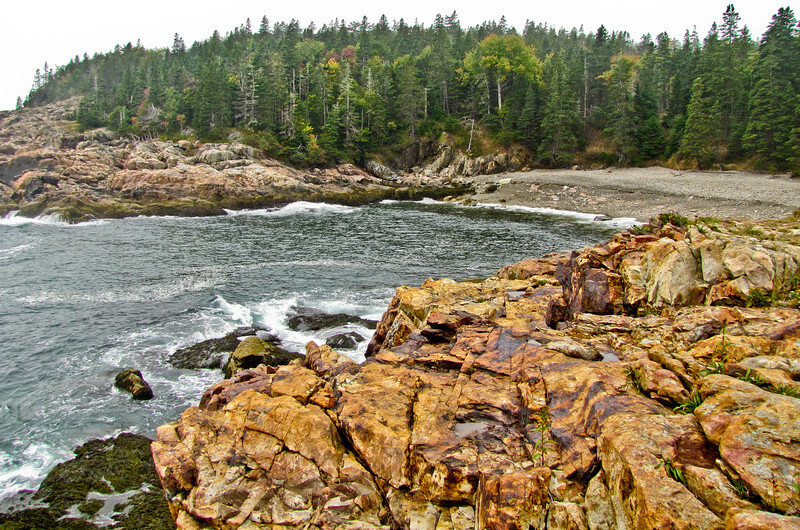 I tried several shots on the cliffs of Quoddy Head to test the effect. As always with HDR, I’d have done better with a tripod…especially as the base exposures all had show shutter speeds due to the overall low level of the light. I did get a few shots that worked though, like the one above. A secondary problem, if you go the HDR route, is Photomatix’s inability to blend exposures where fine detail masks an open sky…trees against the sky are particularly difficult for the app…and you almost always get a light halo around limbs and leaves where the lighter exposure shows through. Changing the smoothing setting can help in making this less obvious but in this image it still shows somewhat in the trees in the upper right. The other way to work the fog is to use Revovery and Fill Light in Lightroom, along with some filter trickery. This shot is not HDR, but I was able to extend the range and keep the fog semi-transparent, by using heavy Recovery, which reduces the highlights in an image without effecting the rest of the tones. Fill Light for the foreground allows me to move the Blackpoint right to increase color depth and contrast. Finally, in this case, the fog in the upper left corner was totally blown out and distractingly white…so I went in with a Local Adjustment Brush, set large with maximum feather, and brushed in an adjustment area in that corner. I used to to reduce exposure and brightness selectively there, producing a more natural grey where it was white. If the area had not been so oddly shaped I would have just used a Graduated Filter Effect pulled down from that corner, but LAB worked better for this image. Canon SX20IS at 28mm equivalent. From Quoddy Head and Lubec ME. Lots of beach and surf and a bit of interest in the sky over Mt. Agamentacus on the horizon. The house on the point is balanced by the people and the dog on the left. Short tel for framing. Canon SX20IS at 70mm equivalent @ f4.0 @ 1/1000th @ ISO 80. Landscape program. Recovery for the sky in Lightroom. Blackpoint adjustment, added Clarity and Vibrance, and Sharpen narrow edges preset.